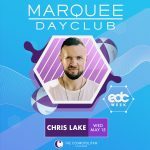 Chris Lake taps into a singular spirit evocative of dance music’s golden age by infusing funked-out grooves and natural instrumentation into decidedly modern house. It’s a sonic aesthetic that instantly incites movement and has established him as a trailblazer in the electronic dance music world. That perspective also set the stage for his forthcoming full-length debut available on Ultra Music in 2014. At 14 years old, the multi-instrumentalist discovered progressive house music, and his life completely changed with the purchase of a synthesizer. His hobby became a profession shortly thereafter. Lake soon went from releasing much talked-about remixes to dropping dancefloor bangers. “Changes” broke the Top 10 on Billboard’s Hot Dance Airplay chart in 2006, while “Carry Me Away” (featuring Emma Hewitt) dominated the same chart a year later. He followed those two early successes with the Top 10 singles “Only One” and “If You Knew,” effectively breaking into the North American market. Performing for packed audiences across the globe, Lake was signed by Ultra Music in 2012, and he went on to collaborate with the likes of Lazy Rich on “Stand Alone” featuring Jareth and Steve Aoki and Tujamo on the 2013 hit “Boneless.” Meanwhile, “Helium,” another collaboration with Jareth and wife Gita Lake, effortlessly transcended aural boundaries with its ethereal electronic hum, guitar twang, and unshakable refrain. After three years, he perfected the track. Then, there’s the single “Squeak,” which encapsulates his enigmatic style and embraces that classic spirit tighter. It fuses funk, electro, melodies and breakdowns into a “groovy” hybrid evocative of Lake’s singular sound. As a result, the best way to meet Lake is to fall into his body of work. Like all timeless music, it’s meant to be an escape, transcending eras, scenes and ages.